Tony Breeden acknowledges the home fans after the final whistle. 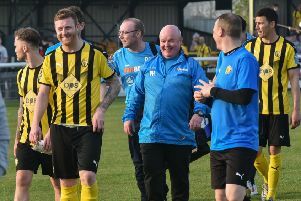 Second-half penalties from Tony Breeden and Callum Gittings earned the three points which almost certainly mean another season of National League North football for Leamington, writes Paul Okey. Breeden stepped up in the 71st minute to smash the ball home after substitute Ahmed Obeng had been bundled over in the box and Gittings’ spot-kick deep into six minutes of injury time meant the celebrations could begin. Another point from their last two games would guarantee safety for Brakes but it would surely now need a remarkable set off results to deny Paul Holleran’s side a second successive season in the Conference. On the hottest day of the year so far, both keepers had plenty of time to catch some rays in the opening stages as the players struggled on a tricky surface. Matt Dodd was unable to get over the ball after a lay-off from Udoh, while Dale Whitham sidefooted over Lee Molyneaux’s cross at the other end when well placed. Breeden comfortably dealt with a Alex Newby shot from distance and bookings for Jake Cottrell and Jack Edwards did little to help the flow of the game. Udoh looked to be on to a mis-hit backpass only to be bodychecked by Scott Leather who received a caution from referee Scott Simpson with the crowd baying for a red. With the temperature dropping off the pitch, the incident did at least serve to raise it on it, with Junior English getting the home side’s first shot on target in the 36th minute. Connor Gudger then entered the referee’s notebook after being deemed to have been out of control while winning the ball and it needed a fine block from James Mace to stop Newby’s shot at source, Whitham skying the follow-up. The first opportunity of the second half went to the visitors, Josh O’Keefe failing to get a decent connection on the ball after the it was pulled back from the byeline. Joe Magunda and Ahmed Obeng entered the fray in place of Joe Clarke and Dodd and Obeng was quickly into the action, seeing his shot blocked after good strength from Udoh. Breeden comfortably gathered a Newby effort but was a little more troubled by a Newby daisy-cutter from distance, tipping it round the post. Chorley captain Andy Teague then headed the resultant free-kick over from close range having lost his marker. It was to prove a costly miss as Brakes were quickly handed a similarly golden chance to break the deadlock. Obeng raced into the box and went down under a challenge from behind from Hughes, with the referee having no hesitation in pointing to the spot. With Dodd off the field, Breeden took the responsibility and blasted it down the middle to emphatically put the hosts ahead. Teague was again granted the freedom of the home box to get in a header but this time it was comfortable for Breeden and Matt Urwin was then forced to pull off a good stop with his feet after Gittings’ shot had taken a wicked deflection. There was tension in the air as the game ticked towards a climax, with six minutes of added time not helping anyone of a home persuasion. However, a couple of confident Breeden claims apart, there was little threat to the Leamington goal as Hood and English confidently marsahlled the defensive effort. Molyneaux ballooned a free-kick over from a promising position in the 93rd minute and the outcome was well and truly settled when Leamington broke and Udoh went down in the box under the challenge of two defenders. Hughes saw red and with Breeden opting to stay safe inside his own half this time, Gittings sent Urwin the wrong way to bring survival within touching distance.